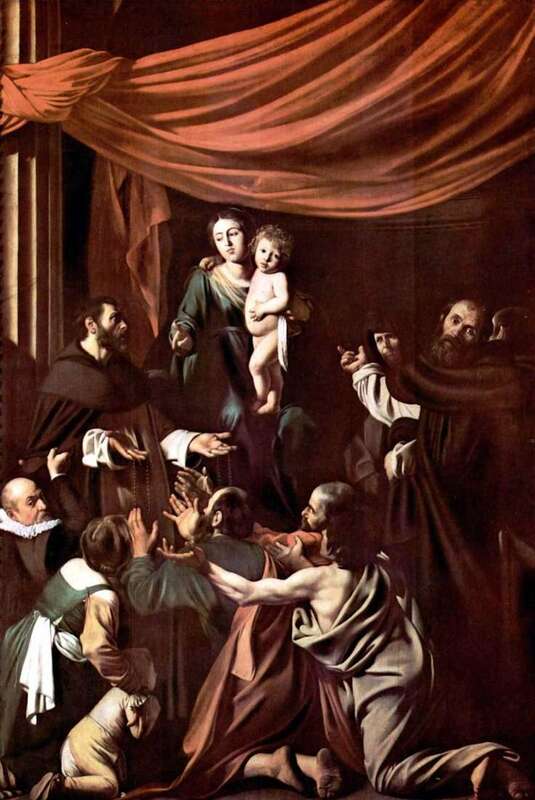 The painting of the Italian artist Caravaggio “Madonna del Rosario” is also widely known under the different name “Madonna of the Rosary”. The size of the painting is 365 x 250 cm, canvas, oil. Originally the painting of Caravaggio was intended for the altar of the church of San Domenico in Naples, but was then put up for sale. In the altar paintings “Madonna del Rosario”, as well as “The Martyrdom of the Apostle Peter” and “The Conversion of Saul,” Caravaggio finds a delicate balance between dramatic pathetic and provocative naturalistic details. From the letter of young Peter Paul Rubens to the Duke of Mantua from September 15, 1607 from Naples. “… I also saw something wonderful created by Caravaggio, which is executed here and is now intended for sale… These are the two most beautiful paintings of Michelangelo and Caravaggio, one is” Madonna del Rosario “and it is performed as an altar picture. sizes with half-figures – “Judith, killing Holofernes” … “From the picture to the picture grows the tragic power of the images of Caravaggio. In the “Position in the Coffin” on a deep dark background, a closely knit group of people close to Christ, who lower his body to the grave, stand out in bright light. They are rude and restrained in their feelings, but the movement of each is marked by special concentration. And only the hands of Mary, raised in a pathetic impulse of despair, set off the severe grief of the other characters, contrasting with the pressing weight of the lifeless body of Christ. The tombstone, at the edge of which the bearing bodies have stopped, emphasizes the statuary, the monolithic nature of the entire group, likened to a kind of monument. The view from below strengthens the impression of majesty. Description and meaning of the painting Madonna del Rosario by Michelangelo Merisi da Caravaggio.